Throughout its 31-year period of shepherding by Artistic Director David Felder, June In Buffalo is and always has been, a place and time for like-minded musicians to get together and work on their craft, creating new ways of making music by writing it, playing it and listening to it. It’s a week-long venue for teaching with workshops and lectures offering student performers and composers the opportunity of interacting with established artists who can talk about methodology and proffer critiques to help hone the participant’s abilities. Budding composers have a shot at having their works presented before an audience of peers and played by artists whose talent and sympathy for the idiom are impeccably credentialed. Listening to much of the music by festival participants, it is apparent that the modern sonic palette has expanded to the point where various “found objects” can combine with ambient and electronic sounds and be considered legitimate elements in a piece of music. It’s also clear that the notation needed to guide the musician along the composer’s path has gotten extremely complex to write and follow. No longer is it a matter of pianissimo or forte; there are now specific directions on how to bow a violin that would have befuddled Paganini and amazed Heifetz. The notation issue is something that most listeners wouldn’t necessarily think about but, in the kind of music heard at JIB, getting the communication between composer and player right means that the marks in the score, whether they’re written on paper or seen on a computer, are often peculiarly specific. 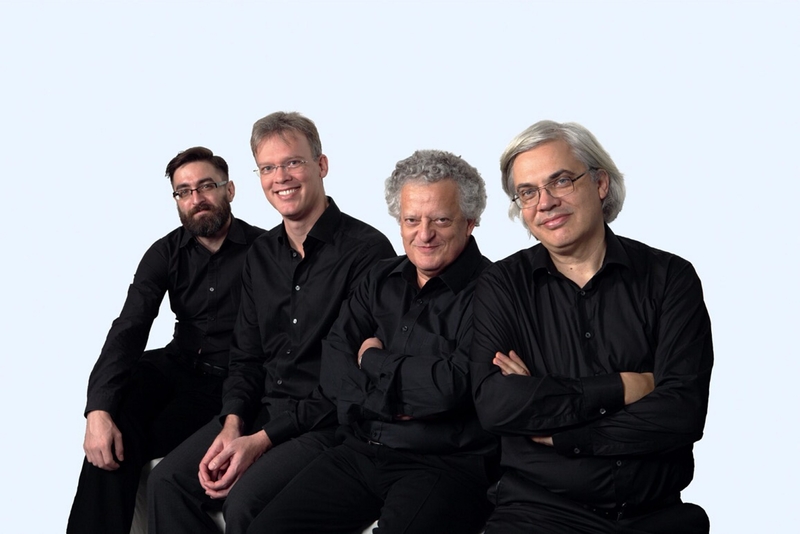 You could tell just how important notation is in this new music when the Arditti Quartet was running workshops, playing the scores of some young composers, and engaging in feedback with them. This type of conversation served a purpose by making sure that the players knew what the composer wanted and the composer knew what effect was physically awkward to achieve so that a suitable work-around could be found. There was little patience evinced however when a neophyte gave the musicians a score with a careless mistake in notation and had to answer why there was “an accent in the middle of a slur” or, in the case of another composer, a question was posed as to why a phrase in the score was marked “slippery” and what did it mean within the context of the piece. From a musical standpoint, the “faculty” composers (including Levine and Eimermacher) generally delivered the goods to the people best equipped to understand what they were doing. Felder’s oft performed “Linebacker Music” (played by Falletta and the Buffalo Philharmonic Orchestra) was dusted off and the world premiere of his latest string quartet (with electronics) was realized by the Arditti Quartet. Chinary Ung, whose Cambodian heritage was key to a pair of works - “Singing Inside Aura,” a work for violist singing Khmer and Pali texts over accompaniment from the Ensemble Dal Niente, and “Water Rings,” a folk tinged work executed with considerable subtlety by the BPO – made his first appearance at JIB an impressive one. Joshua Fineberg’s use of electronic sounds in “Paradigms” (with Ensemble Dal Niente) and in “La Quintina” (with the Arditti Quartet) were right in line with the proliferation of amplified sonic mutations heard elsewhere during the festival. JIB is always a mixed blessing for the listener but, to be fair, there are almost always things capable of amazing and astounding an audience, you just have to be there at the right time to experience it. The caveat: It should be noted that the purpose of JIB is tightly focused and, with the possible exception of appearances by classical music superstars like Steve Reich, Philip Glass,or the Kronos Quartet in the past, an attempt to reach out to the community at large isn’t a high priority. This doesn’t necessarily take away from the importance of the event from an artistic standpoint but there is certainly a tacit awareness that what goes on at JIB will never be as popular as “America’s Got Talent”.